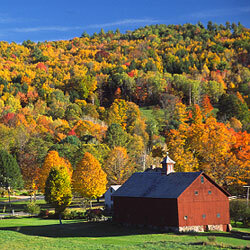 When it comes to healthy living, New England sets the standard for the rest of the United States. The six states that comprise New England all rank in the top 10 of the 2009 listing of the healthiest states, with Vermont leading the way. Following Vermont, in order, are Utah, Massachusetts, Hawaii, New Hampshire, Minnesota, Connecticut, Colorado, Maine and Rhode Island, according to the 20th anniversary edition of America’s Health Rankings™, a report issued by the United Health Foundation, the American Public Health Association and Partnership for Prevention. For the ninth consecutive year, Mississippi ranks as the least healthy state, falling in the bottom five states on 11 of the 22 measures used to determine the rankings. Southern states account for eight of the states in the bottom 10, with several facing health challenges such as higher smoking and obesity rates and low high school graduation rates. New England states, by contrast, generally enjoy advantages such as low obesity, child-poverty and violent-crime rates, as well as ready availability of primary-care doctors. a low percentage of children in poverty (9.8 percent of persons under age 18). a low obesity rate (23.2 percent of the population). a high rate of high-school graduation, with 82.3 percent of incoming ninth-graders graduating within four years. ready availability of primary-care physicians, with 168.8 primary-care physicians per 100,000 residents. But ranking in the top 10 does not make states immune to health challenges. Vermont, Massachusetts, Connecticut and Rhode Island, for example, all have a high prevalence of binge drinking, according to the report. Vermont’s other primary health challenge is moderate immunization coverage, with 74.4 percent of children, ages 19 to 35 months, receiving complete immunizations. The key to improving the nation’s health is changing unhealthy behaviors that contribute to preventable, chronic diseases, according to the report, which identifies tobacco consumption and obesity as today’s top two health threats. Although the rate of tobacco use declined to 18.3 percent of the population in 2009 from 19.8 percent in 2008, tobacco use still causes about 440,000 deaths annually, the report said. Obesity, meanwhile, has increased nearly 130 percent since the first edition of America’s Health Rankings, with 27 percent of the U.S. population now identified as obese. More information about the report can be found at www.americashealthrankings.org.